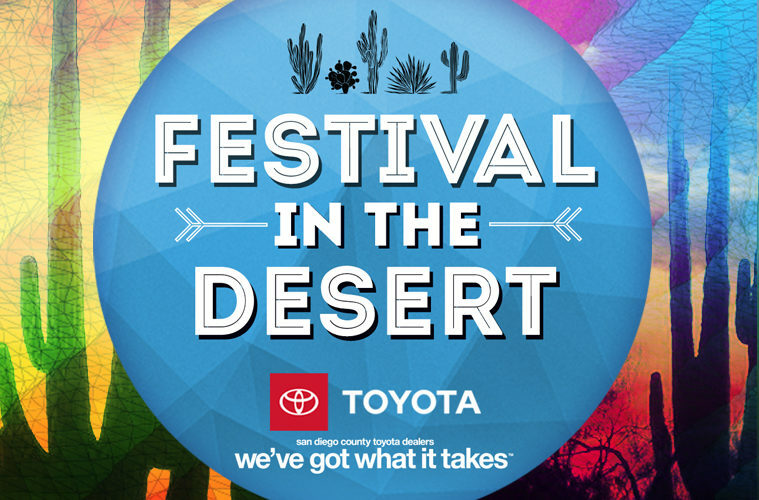 Coachella and Goldenvoice are not a sponsor or co-sponsor of this promotion, or otherwise affiliated with this promotion. Sweepstakes dates: March 18 – April 17 at 5:00 p.m. Terms and Conditions of Entry: NO PURCHASE IS NECESSARY TO ENTER OR TO WIN. VOID WHERE PROHIBITED BY LAW. A PURCHASE WILL NOT INCREASE YOUR ODDS OF WINNING. ALL FEDERAL, STATE AND LOCAL LAWS, RULES AND REGULATIONS APPLY. This Sweepstakes (“Sweepstakes”) is operated by Local Media San Diego, LLC. (together, “Operator”) and hosted on the “Sponsor” (San Diego Toyota Dealers) Instagram Page. The Sweepstakes is subject to these Official Sweepstakes Rules. The Sweepstakes shall begin on the start date and all entries must be placed and received within the period specified on Sweepstakes Entry Page (the “Entry Deadline”). Registration is free of charge. An entry will not be valid unless all of the required fields of the online registration form are completed and the information is valid. Once submitted, an entry cannot be deleted, canceled or modified, except by the Operator. You may also participate in a Sweepstakes through an offline entry. To enter offline, you must mail a 3″ x 5″ card to Local Media San Diego, LLC, 6160 Cornerstone Court, East, Suite 150, San Diego, CA 92121. The card must include the following information in legible, hand-printed or typed English: your full legal name, complete home postal address, home telephone number with area code, email address, and name of the Sweepstakes. All offline entries must be received on or before the entry deadline , except that if a Sweepstakes entry deadline is on a Saturday, Sunday or holiday , your offline entries must be received by April 17, 20;19 at 5 p.m. Operator is not responsible for any incomplete, late, lost, misappropriated, illegible, damaged, postage-due or misdirected mail-in entries, or for failure to receive online entries due to transmission failures or technical failures of any kind, including, without limitation, malfunctioning or unavailability of any network, hardware or software, whether originating with sender or Operator. Eligibility and Limitations: Sweepstakes is open to all natural persons and legal residents of San Diego County. You must be at least 18 years of age to enter. You must have a valid street address in San Diego County. (a P.O. Box address will not suffice). Employees of Local Media San Diego, LLC, the Sweepstakes’ participating sponsors and their advertising agencies, employees of other radio or television stations, and members of the immediate family of any such persons are not eligible to participate and win. The term “immediate family” includes spouses, siblings, parents, children, grandparents, and grandchildren, whether as “in-laws,” or by current or past marriage(s), remarriage(s), adoption, co-habitation or other family extension, and any other persons residing at the same household whether or not related. The Approximate Retail Value of each prize is determined by Local Media San Diego, LLC. One winner, as specified on the Sweepstakes Information Page. No prize transfer permitted. No prizes will be refunded or exchanged for cash. If a prize is unavailable, Operator reserves the sole right to substitute a prize of equal or greater value. All taxes, fees, and surcharges on prizes are the sole responsibility of the winner. Operator will not ship any prizes to an address inside or outside San Diego County. Winner notification: Winners will be notified via direct message to User Instagram account. If no response is received within 24 hours, the prize will rescind and an alternate winner will be selected. Taxes: Any valuation of the prize(s) is based on available information provided to the Company, and the value of any prize awarded to a winner may be reported for tax purposes as required by law. Each winner is solely responsible for reporting and paying any and all applicable taxes. Each winner must provide the Company with valid identification and a valid taxpayer identification number or social security number before any prize will be awarded. Prizes are not transferable, redeemable for cash or exchangeable for any other prize. Any person winning over $600 in prizes from Local Media San Diego, LLC will receive an IRS form 1099 at the end of the calendar year and a copy of such form will be filed with the IRS. Publicity Privacy: Per Instagram Rules. Limitation on Liability: By entering, all entrants release Operator and their respective affiliates, subsidiaries, parent companies, officers, directors, agents, promotional partners and employees from any and all liability with respect to or in any way arising from this Sweepstakes and/or acceptance or use of the prizes, including liability for personal injury, death, damages, or loss. Operator is not responsible for prize quality or utility. Operator is not responsible for any incorrect or inaccurate information, whether caused by website users. Operator is not responsible for cheating or fraud by any entrants. Any activities intended to disrupt or interfere with the proper play of the Sweepstakes, or to defraud the Sponsor in any way, may be prosecuted to the fullest extent of the law. Participants engaging in any of the foregoing activities will be disqualified and will forfeit any prizes won. If, for any reason, the Sweepstakes is not capable of operating as planned, including, without limitation, as a result of infection by computer virus, bugs, tampering, unauthorized intervention, fraud, technical failures, or any other causes beyond the reasonable control of Operator which corrupt or affect the administration, security, fairness, integrity or proper conduct of this Sweepstakes, Operator reserves the right at their sole discretion to cancel, terminate, modify or suspend the Sweepstakes and award prizes among eligible entries received. Sweepstakes Disputes: As a condition of participating in this Sweepstakes, participant agrees to be bound by these Official Rules and that any and all disputes which cannot be resolved between the parties, and any causes of action arising out of or connected with the Sweepstakes, shall be resolved individually, without resort to any form of class action. Participants consent to the exclusive jurisdiction of the courts located in San Diego county, California and agree that all matters pertaining to these Official Rules and disputes arising hereunder shall be governed by and interpreted in accordance with the laws of the State of California, without regard to any conflicts or choice of law rules or provisions (whether of California or any other jurisdiction). Further, notwithstanding the Terms, in any such dispute, under no circumstances will participant be permitted to obtain awards for, and participant hereby waives all rights to claim, punitive, incidental or consequential damages, including attorneys’ fees, other than participant’s actual out-of-pocket expenses (i.e., his or her costs associated with entering this Sweepstakes), and participant further waives all rights to have damages multiplied or increased. The invalidity or unenforceability of any provision of these Official Rules shall not affect the validity or enforceability of any other provision. In the event that any provision of these Official Rules is found to be invalid or unenforceable, these Official Rules shall be construed in accordance with their terms as if the invalid or unenforceable provision was not contained therein. Winner’s List: For a Winner’s List, available thirty (30) days following the end of the Sweepstakes Period, send a self-addressed, stamped envelope to: Local Media San Diego, LLC 6160 Cornerstone Court, East, Suite 150, San Diego, CA 92121. Please include the following in your Winner’s List request: Your full legal name, name of station and indicate which winner’s list you would like to receive. Please include 1 self-addressed, outer postmarked envelope for every list requested. Operators: This Sweepstakes is operated by Local Media San Diego, LLC. To contact the Operators, write to Local Media San Diego, LLC, 6160 Cornerstone Court, East, Suite 150, San Diego, CA 92121.